When I first started working I viewed networking as a bunch of people who don’t know each other at some event making small talk and handing out business cards. Because cold approaching a stranger made me feel uncomfortable, I shunned networking, accepting the created view it was nothing but a bunch of people self-interested trying to sell something. My career network has essentially been people who I happened to share carpet with on a daily basis. As my career developed, something weird happened, I subconsciously got better at networking – the best thing was I was carrying out this practice without attending any awkward social events. 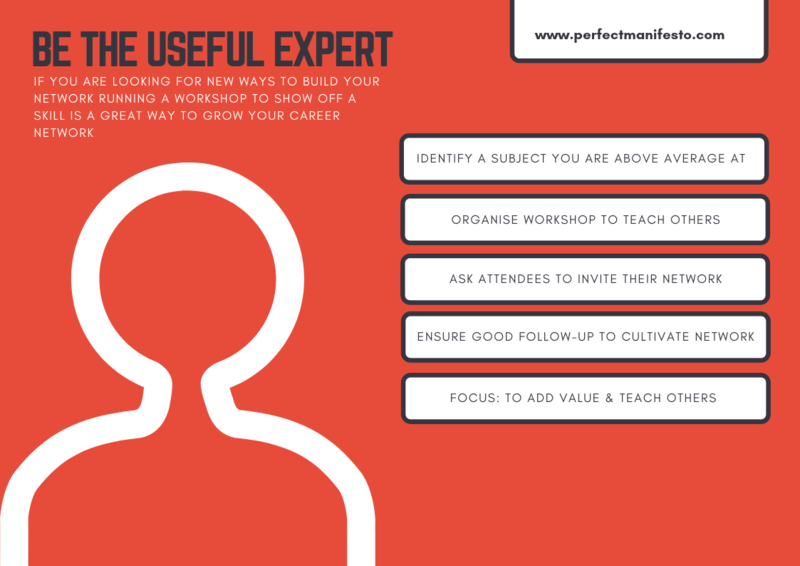 The techniques in my networking arsenal have developed from my more thoughtful approach – a favourite is ‘the useful expert’. A useful expert? But I’m not an expert in anything! In most jobs you probably are expected to complete a number of tasks, therefore there may not be any particular skill you have with a certain level of mastery. Don’t worry! From experience, if you are above average to everyone else at something, its inevitable someone will at some point refer to you as a guru or subject matter expert (SME) on the topic. If you are stumped what your expertise is, think about what people come to you first about when they need a problem solving. The difference between an expert and a useful expert is that the latter is selfless enough willing to share their skills with others. This willingness to share can be taken advantage of by organising a training workshop to pass on your skills and experiences. Use this as an opportunity by inviting your network and asking them to pass on the invite for other people they know who might be interested. Beyond networking you show positives of going above and beyond the requirements of your role and increases your legitimacy that you are the SME on the topic to your colleagues and a wider audience – you are showing them what you know. If you identify a skill that is in short supply / high demand, then coordinate these intentions with management as they will love you for providing free training! It is not simply a case of running a workshop and hope for the best, you need to work the outcome of the knowledge share. Take action to follow-up with attendees, signpost to any of your LinkedIn blogs, seek feedback, follow-up on any questions / problems raised. Cultivate your network! During the process make sure you are adding value, if what you are doing is just a brag it will be obvious and people will be pissed off at you wasting their time. Although you may be wanting something from the experience – always consider your colleagues needs first! The positives of arranging training sessions is it attracts fellow enthusiasts of the subject, who you can work with to your advantage sharing experiences, tips and tricks. As mentioned you make yourself stand-out from the crowd, however don’t assume you will get rewarded for the additional effort – I would recommend going in with the motivation to simply to build your network and help educate others on a topic you are passionate about. By organising these sessions be prepared to legitmise yourself as the expert. This can be a negative if you are pressed for time, which I found after organising traing on Microsoft Teams I became the ‘MS Teams guy’, being recommended to provided further support by the people it’s hard to say no to! Teaching others doesn’t just have to focus on hard skills, think broadly what you can do? Are there any lessons learned from a project that didn’t quite go as planned? Interesting leadership / soft skills you have? Sharing the main learning points from an interesting course that you have been put on? If you feel uncomfortable doing large workshops / webinars, selected trusted colleagues and get them to invite someone outside your network to deliver more personal hands on small group sessions. Have you used a similiar approach to build your networking? Do you have other networking tips?